12.1915: Completed by Dundee Shipbuilding Co Ltd, Dundee (Yd.No.275) for the The Lancashire Steam Fishing Co Ltd, Fleetwood as ALIDA. 10.12.1915: Registered at Fleetwood (FD192). 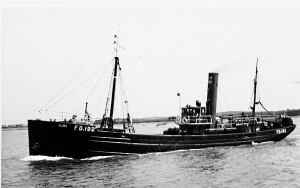 Requisitioned by The Admiralty from the builders and fitted out as armed trawler (1-6pdr) (Ad.No.1977). 1919: Returned to owner at Fleetwood (James A. Robertson, manager). 12.10.1924: Edward Towne appointed manager. 20.6.1929: Pursued by HMS SPEY when illegally trawling in the Firth of Clyde. 21.6.1929: At Campbeltown Sheriff Court, Sk. William Harrison, pleaded guilty and was fined £170, to illegal trawling, concealment of identification marks and for refusing to stop. The nets and gear were ordered to be forfeited. For assaulting an AB of the boarding party, Jack Weyman, deckhand was fined £3.3s. 1930: Sold to J. Marr & Son Ltd, Fleetwood (Geoffrey Edwards Marr, manager). 20.10.1932: At Stornoway Sheriff Court, Sk. William Rendall Drever was fined £100 for fishing within the limit in the Minch, 21/4 miles off Tolsta. Nets and gear were forfeited and further fine of £15 was imposed for not displaying regulation lights. 22.1.1940: Requisitioned for war service as a boom defence vessel (P.No.Z.152) (Hire rate £74.5.0d/month). 6.6.1944: Replaced Netherlands trawler UIVER as boom defence vessel in Mooring Force B. 1944: Based at Felixstowe (Groom & Sons Ltd, Harwich, agents). 1946: Laid up at Felixstowe. 16.4.1947: Advertised for sale by tender and open for inspection and open for inspection. Not to be resold within two years. 1947: Sold to Jacques Bakker en Zonen, Bruges for breaking up. 23/01/2009: Page published. 11 revisions since then. 04/06/2017: Removed FMHT watermark from image. This entry was posted in Steam Trawlers, Steamers (Picture) and tagged Lancashire SFC, Marr on January 23, 2009 by Fred Smith.